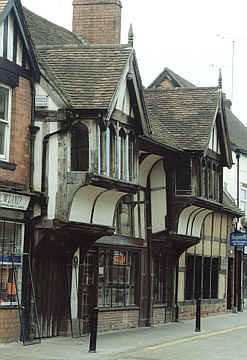 Coventry has an important historical place in the region, and there are some attractive historical buildings that can still be found in the City. 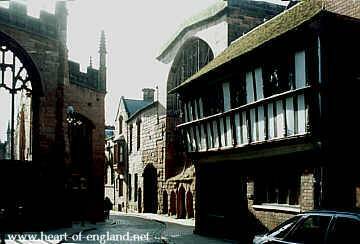 In the mid-14th Century, Coventry was the largest and most important town in the Midlands of England. Coventry grew to prosperity through a trade in wool and textiles. Later it became the main centre in England for the manufacture of watches, bicycles, and then cars. Today the City employs workers in the sevice industries, light enginerring, and telecommunications. 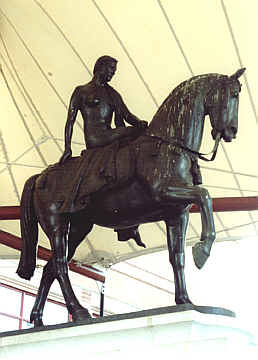 The City is also famous for its connections with Lady Godiva, and the Cathedral of St Michael, which was destroyed during the Blitz. 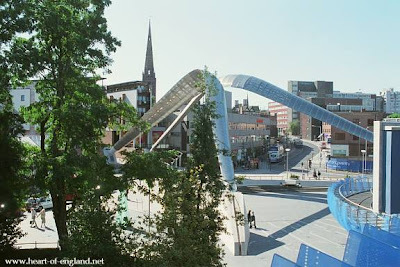 "In the middle of England like the hub of a wheel stands Coventry, the town of Fortune's Wheel, for the wheel has made its fortune. It is England's birthplace of the age of speed and swift communications. Coventry gave us the means to span continents in the aeroplane; it made all England our parish if we own a car. The city puts a girdle round the earth with its telecommunications. If we turn back the pages of this town's history as a manufacturing centre we see how one great industry and then another has risen and often declined, but how the long view has made Coventry what it is." The approach to Coventry from the South is impressive. This picture shows the approach to Coventry along the road from Warwick and Stratford. 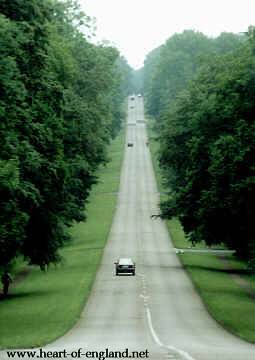 It is an avenue over a mile long with broad verges, backed by banks of mature oak and beech. 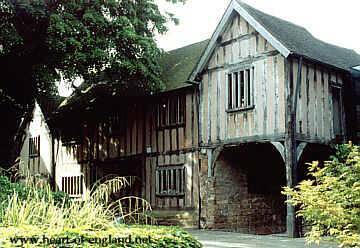 One of the oldest habitations in Coventry was a nunnery, near the present town centre. This was sacked by the Danes in 1011. Between 1020-1043, the Saxon Earl Leofric and his wife, Lady Godiva, founded a Benedictine Abbey on the site of the nunnery. All that remains, above ground, of the abbey are some foundations. The two buildings shown left are the Old Blue Coat School, built on the old foundations, in 1850. There is another view of some of the abbey foundations further down the page. 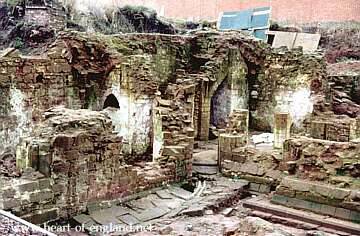 Leofric and Godiva endowed the abbey with extensive estates and it soon became one of the richest foundations in the midlands. 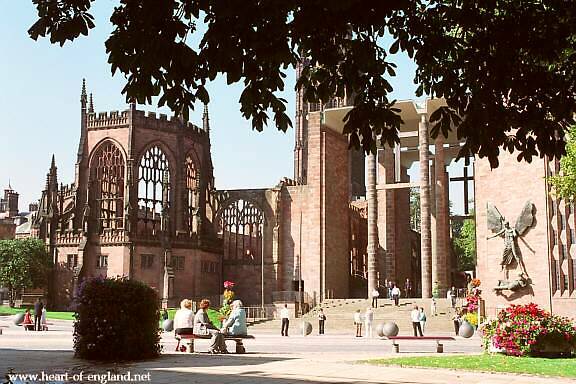 In 1102 the abbey church became Coventry's first Cathedral, and the abbey became a Priory. (Abbeys and priories are both monastic houses. A priory is associated with a cathedral, but an abbey is independant). Around 1540, with the dissolution of the monasteries, the original Cathedral here and its priory were demolished, under the orders of Henry VIII. 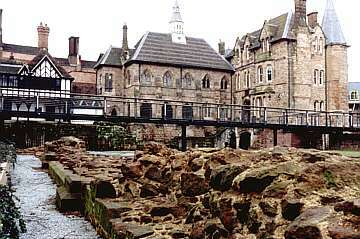 The remains of the Cathedral of St Mary and its Priory. This was the oldest and grandest church. The surviving buildings are shown in the photo above. Very little of the original buildings remains above ground. Built alongside and parallel to the Cathedral of St Mary is a very large church, Holy Trinity Church, shown right. 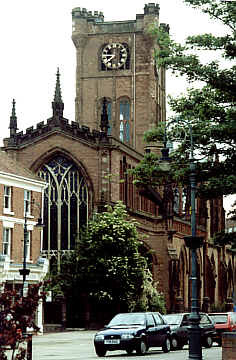 This is the parish church for the West side of the centre of Coventry. At the East end of the Priory Cathedral of St Mary, and perpendicular to it is the New Cathedral Church of St Michael, built in the 1960's (described further down this page). At the South end of the New Cathedral is the shell of the Old St Michael's Cathedral (also described further down this page). This was formerly the parish church for the East side of the City, and was made a cathedral in 1918. This was the cathedral that was destroyed during the Blitz. This plan shows the 4 churches: the outlines of the Cathedral of St Mary and its Priory (in blue), together with the existing Holy Trinity Church, and the New and Old Cathedrals of St Michael. The two small surviving buildings of the Priory (in the photo above left) are shown black on the plan. Quite recently some excavations have been performed around the area at the top of this plan, and some medieval stonework has been unearthed (more details just below). A visitors centre has been built (shown green) and the remainder of the area is in the process of being made into a condition suitable for visitors. 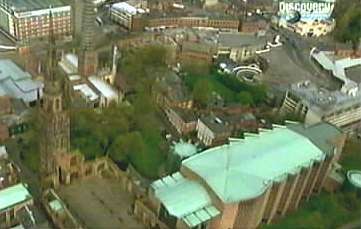 The initial excavation of the grounds of Coventry's Cathedral of St Mary and Priory was undertaken by the Channel 4 TV archaeology program Time Team. Coventry City Council are redeveloping this area and had asked Time Team to visit the site. 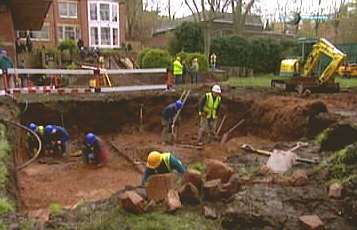 This picture shows the Time Team at work on the excavation. The Time Team TV program has been repeated on the Discovery Channel. Pictures in this section which have the "Discovery Channel" icon at the top right corner, are from that program. The very recent pictures at the bottom of the section are my own. This aerial photo shows the area, just before excavation. 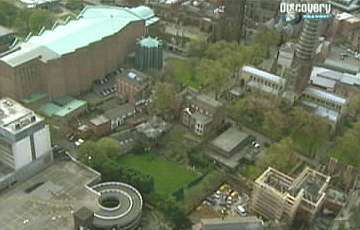 In the left foreground of the picture is the shell of the Old St Michael's; in the right foreground, with the green roof, is the New Cathedral; Holy Trinity can be seen towards the upper left. The area formerly covered by the Priory Cathedral consists of the two areas of grass, and the buildings in the centre of the picture. An aerial view from a different angle, giving a better view of Holy Trinity, now on the right. 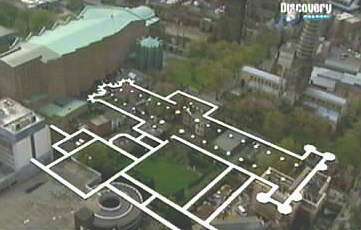 This shows a plan of the Priory Cathedral, superimposed on the aerial photo above. 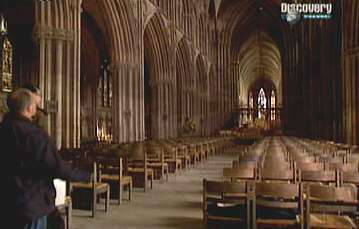 Coventry's Cathedal of St Mary is believed to have been very similar to Lichfield Cathedral, which is about 40 miles away. Coventry was the only cathedral to be demolished during the dissolution. 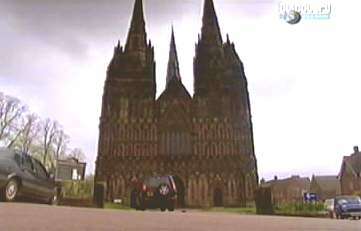 This picture shows the West front of Lichfield Cathedral today. Here Tony Robinson, the Time Team presenter, visits Lichfield Cathedral. 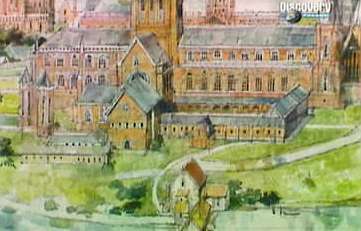 This painting is a reconstruction showing how Coventry's Cathderal of St Mary and its Priory, would have originally appeared, in its medieval hilltop setting. This photo shows the foundations of the West Front of the cathedral. These moss-covered stones have been uncovered for some years. The stonework in the foreground of this picture is the recently unearthed base of the South Wall of the Cathedral. This picture shows the best of the excavations of the Priory. This site is about 50 yards from the Cathedral wall above. 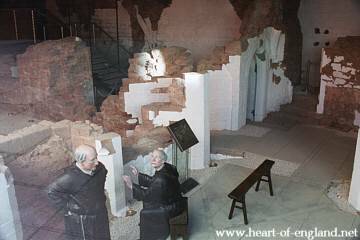 When these pictures were taken (February 2002), work was about to start to make the area available to visitors. A modern building was erected over the top of the ruins, and the ruins were maintained, effectively forming part of the basement of the new appartment block. There is a large window, at street level, from which visitors can look down into the basement of the new building and see this view of the ruin. 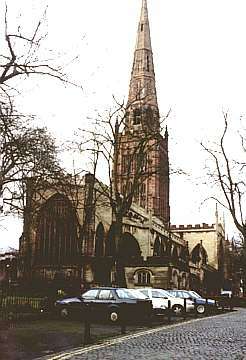 Most visitors to Coventry today come to visit the Cathedral Church of St Michael's, which was destroyed during the Blitz. Most people share a sense of sorrow that such a beautiful religious building should have been wantonly destroyed. 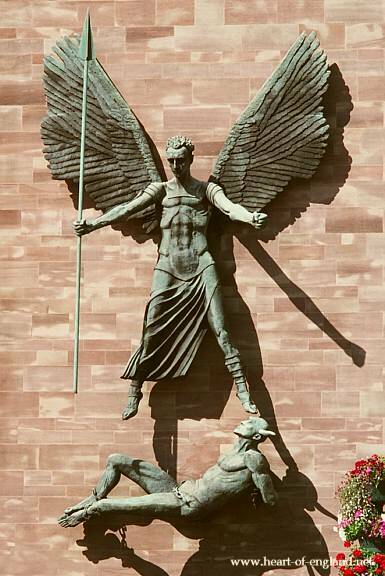 The Cathedral Church of St Michael has become an international symbol of forgiveness and reconciliation. 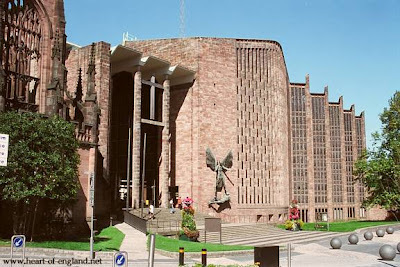 However, Coventry's former cathedral, which was even more glorious, was also destroyed by the hand of man. But this was not done by "wicked Germans", but under the orders of England's own King. If you wish to draw moral lessons from Coventry's past, Coventry offers much to ponder. Soon after the foundation of the priory, a market and small town began to develop. By the beginning of the 12th century the abbey was served by two churches, Holy Trinity, fronting on the market place, and an independent church at nearby Radford. 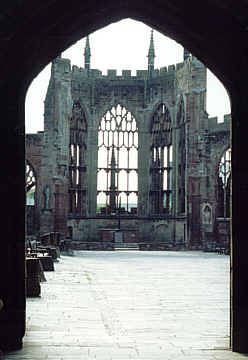 The prosperity of the abbey encouraged the Bishop of Chester to transfer the diocesian see to Coventry in 1095. By 1150 more than a dozen textile mills had become built in the town, and the textile trade had become the foundation of the town's prospetity and growth. 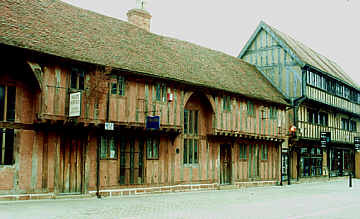 By the 14th century merchants were building large timber-framed houses with cellars in which to store their merchandise. This picture, actually taken in 1900, shows Butcher Row, and gives a good impression of how Coventry would have been at that time. This picture was taken from near the same place, today. By 1300 Coventry mechants were engaged in an international wool trade. The city's prosperity rested not just on the manufacture of cloth, but on its dyes and its non-fading Coventry-blue cloth. By 1345 the power of the merchants in the the town had become so great that the town was granted a charter so that it became governed by a mayor, rather than by the priory. In the mid-14th century the most important wool merchants in the country were Warwickshire men, mostly from Coventry. Most wool was exported thorugh London, and the trading links between Coventry and London became very strong. On 19 occasions between 1349 and 1377 the mayor of Coventry was a wool merchant. 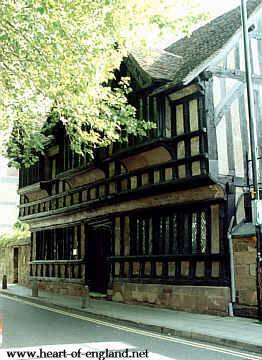 In 1398 Coventry was the largest wool marketing and production centre in England. The town gave employment to a host of related trades including weavers, dyers, tailors and drapers. 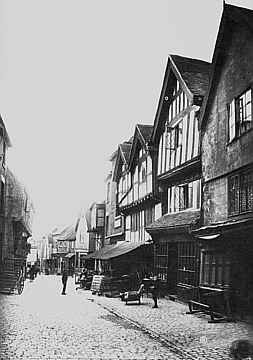 This picture shows Spon Street in Coventry, today. This street has been preserved as a heritage area, and many of the buildings have been restored to their medieval appearance. A few of the buildings in Spon Street were originally located in other parts of the town, and were taken apart and re-assembled here. Cloth manufacture declined in the 16th and 17th centuries, but other related higher-value trades rose to prominence. Caps were made from high quality wool and felt, and the cappers became one of Coventry richest and most important guilds. By 1815 some 10,000 workers were engaged in high quality ribbon-making, half of Coventry's population. In the 1850's 25,000 people in Coventry were employed in ribbon-weaving. A high proportion was made of locally produced silk. Glove making had been a speciality in nearby Stratford-Upon-Avom. William Shakepeare's father, John Shakepeare, had been a glovemaker. Some of the wealthy merchants helped to found charitable institutions in the town. While their fortunes and the houses that they owned have disappeared, they are remembered now by the institutions that bear their names. There is Thomas Bond's Hospital, John Hale's Hospital and later Grammar School in Hales Street, and Ford's Hospital. 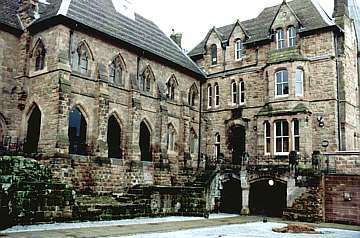 Ford's Hospital, shown here, was an almshouse for elderly men and women, and was provided for in the will of William Ford. It is one of the finest examples of 16th century architecture in the country. St Mary's Guild Hall is the heart of Coventry. The various trades were organised into guilds. 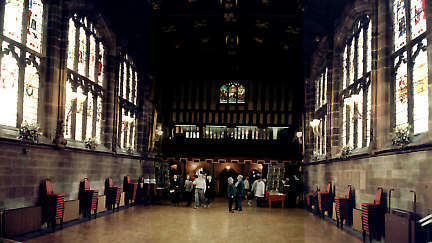 The guilds would meet to discuss the town's affairs at the guild hall. 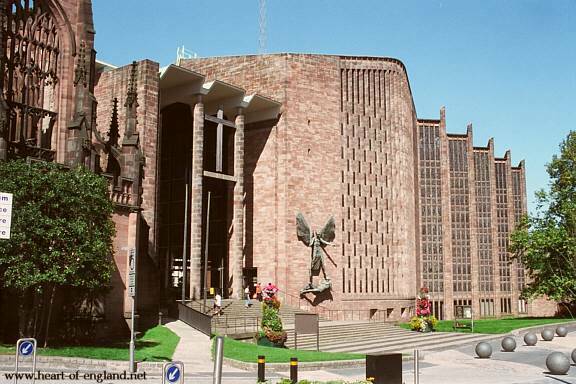 Coventry's guild hall was built between 1340 and 1460, and is among the finest examples of a medieval guild hall in the country. Here also visiting dignitaries would be entertained. This picture shows Bayley Lane, with the old cathedral on the left, and the guild hall in the centre. The building does not look very attractive from outside, but the inside is impressive, shown in the photo below. The stained glass windows around the hall are portraits of the kings of England. There are also life-size paintings of the kings of England on the wall, at the far end, though not easily visible in the photo above. On the opposite wall (behind my back) is a tapestry depicting Henry VI, who was frequently entertained here. 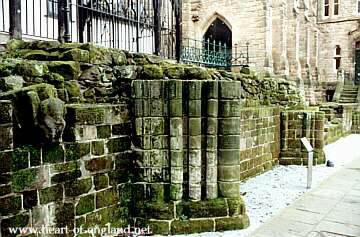 Work began on the town wall in the 1355 and took 40 years to complete. The whole town wall was nearly three miles long, eight to nine feet thick, and had a defensive ditch on the outside. It was the most substantial town defence outside London. 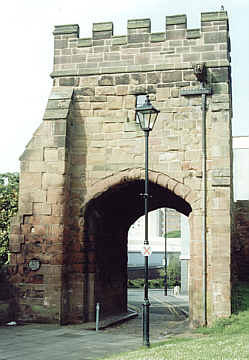 During the Civil War, Royalist forces were denied entry into the City, and in 1662 Charles II ordered that the town wall should be demolished. 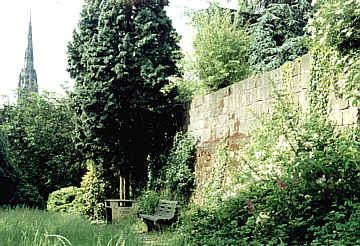 Very little of the town wall now remains, but there are still some short sections remaining. The best preserved section is this part between the Cook Street Gate and the Swanswell Gate. There were 12 original gates, but only three remain. This is the Cook Street Gate, which is the best preserved. This gate is listed as a national historic monument. The gates were equipped with portculises. An interesting feature of this gate is a gargoyle which you can just see jutting out of the wall at the upper right. Cheylesmore Manor House is what remains of a Royal Palace, which dates back to 1250. This building is in a part of the town which is now largely occupied by solicitors and estate agents. 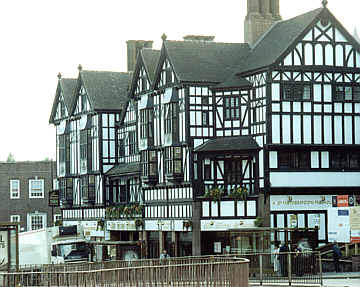 This half-timbered building was part of the manor where Queen Isabella and the Black Prince stayed in the 14th century. The Church of St John The Baptist was founded by Queen Isabella in 1344, as a chapel in memory of her dead husband, King Edward II. The church became a parish church in 1734. During the civil war, the building was used as a prison for captured Royalists. Captured Royalists were sent to this prison, in Coventry, and this was the origin of the phrase sent to Coventry. The Cathedral Church of St Michael dated from the early 13th century. This was originally a parish church, and was raised to the status of cathedral in 1918. 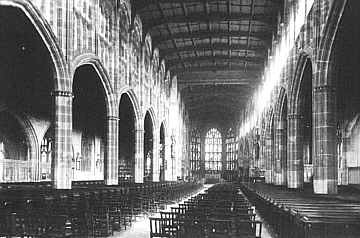 This picture showing the interior view was taken in 1939. During the Second World War, in a bombing raid on 14 November 1940, the cathedral was destroyed, together with 75% of the buildings in the inner area of the city. After the war a new cathedral was built alongside the ruins of the old one. The new cathderal was designed by Sir Basil Spence. Many craftsmen and artists from around the country were commissioned to contribute to the new cathedral. These included an abstract stained glass window designed by John Piper; a great engraved screen of clear glass designed by John Hutton; the bronze statue of St Michael and the Devil designed by Sir Jacob Epstein (shown in this photo), and a huge tapestry behind the cathedral altar designed by Graham Sutherland. Clocks and watches came into domestic use in the early 17th century, and by the 1660 watch making was well established in Coventry. By the 1850s there were some 2,000 watchmakers in Coventry. In 1863 the Coventry Sewing Machine Company was founded, originally to make sewing machine. However, against strong competition from foreign companies the enterprise did not flourish, and it turned to making bicycles. In 1896, it became Swift Cycles, and was the germ of a rapidly expanding bicycle market. By 1896, Coventry's Premier Cycle Company was the largest in the world, with an output of 20,000 units per year. This network of small engineering firms became the backbone of the motor car industry. In January 1896 the Daimler Motor Company of Coventry was registered as the first manufacturer of cars. Around 120 motor car firms subsequently built factories in the city. In the early 1900's the City's industrial skills were turned to making armaments. 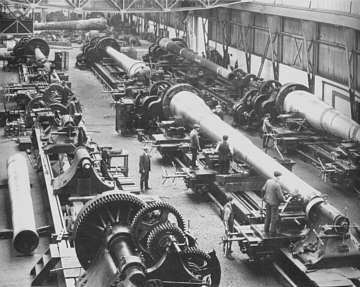 This picture shows battleship gun-barrels being manufactured. The City also began to manufacture tanks, and later, aircraft parts. At the time of the Second World War, the City was an obvious military target. The 1950's and 1960's were periods of rapid growth in the ownership of private cars. Many of the countries major car producers were based in Coventry - Damiler/Rolls Royce, Talbot/Hillman/Humber, Standard-Triumph, and Jaguar. 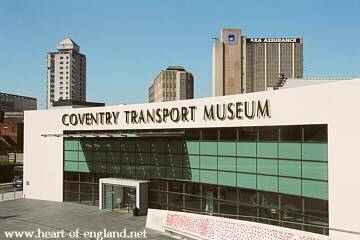 The city's Museum of British Road Transport holds a collection of around 200 cars, plus bicycles, buses and other road transport. 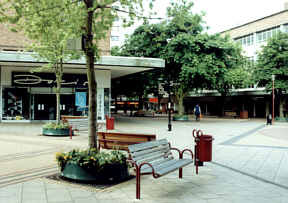 After the Second World War much of the devastated central area of the City had to be cleared and a shopping precinct was developed. In the 1970's the motor car industry entered a deline. Today the only car manufacturers in the City are Jaguar, which has a manufacturing plant at Browns Lane, and a successful Peugeot plant at Ryton. New manufacturing indutries which have gained strength in the past decade include the service industries and telecommunications. Many large service organisations, are located in business parks around the edge of the City. Most recently the area to the North of the Cathedral has being redeveloped. This futuristic structure is called the Whittle Arch in memory of Frank Whittle, the inventor of the jet engine, who came from Coventry.